There is something so rewarding about planning an intimate dinner party for your friends. 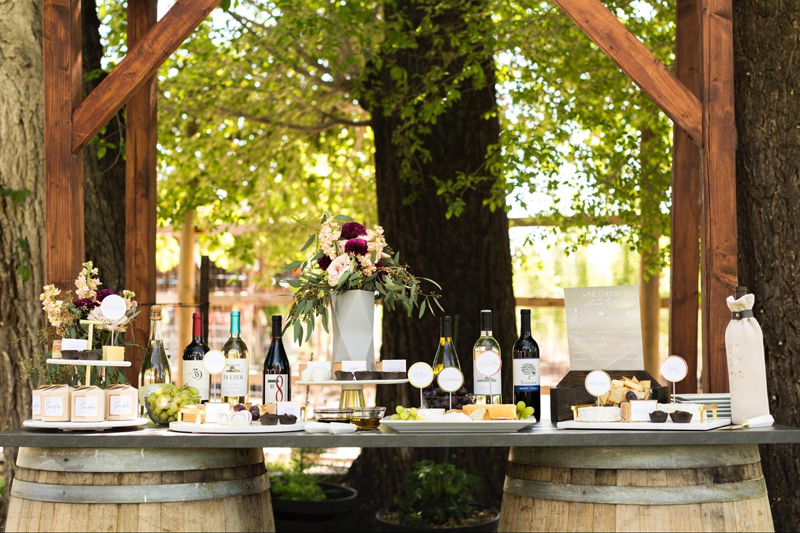 This month, we decided to plan a Wine, Cheese, and Chocolate party so that our friends could have an excuse to dress up and hang out… and eat and drink! 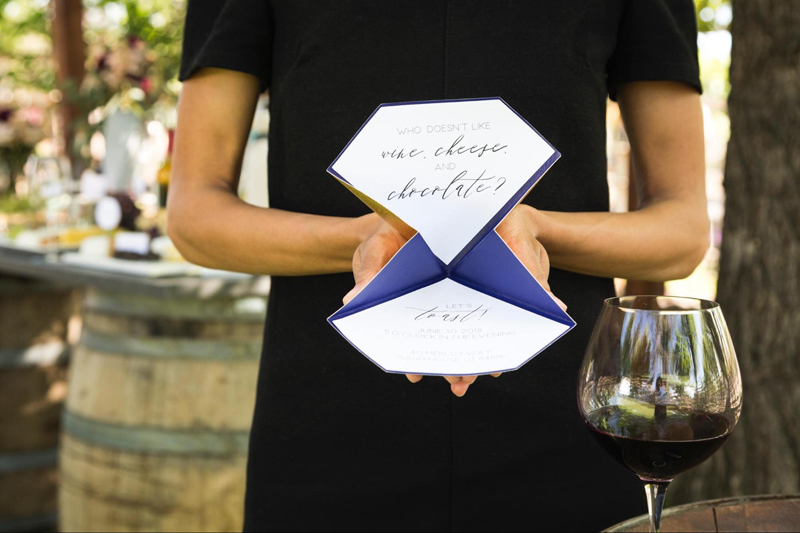 To get our guests excited about our party, we sent out these fun folded invitations. Print then cut and our Scoring Wheel made these a super quick project. 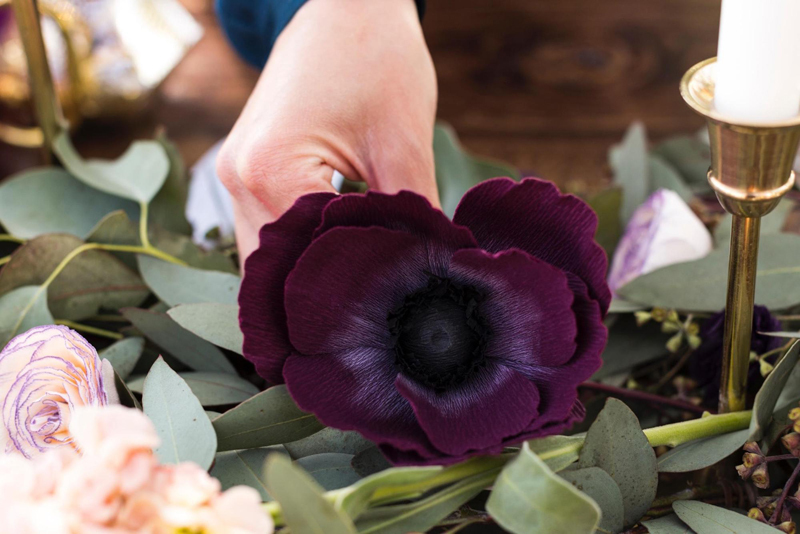 For our actual party, we came up with some really cute (and easy) DIY projects that you can recreate to wow your guests. We set a table and filled it with décor elements made with our Cricut. Can you spot them? We were so happy with how gorgeous everything turned out—it definitely did not feel handmade. 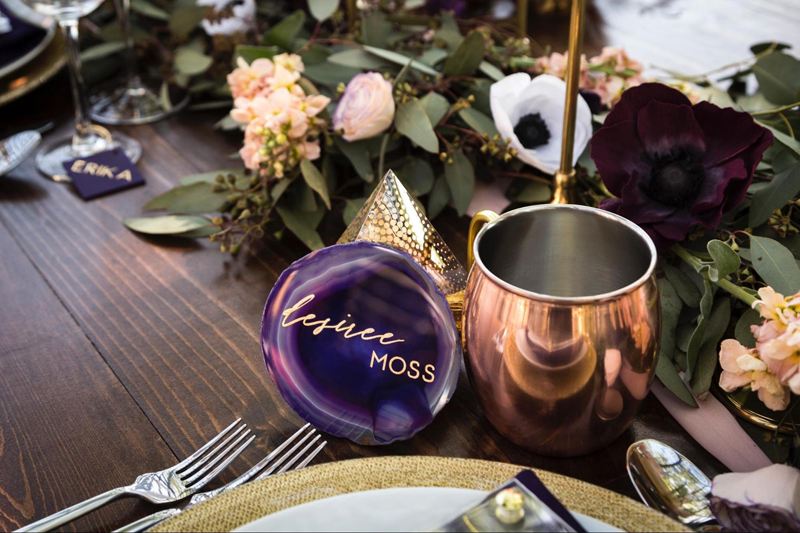 I created these fun place cards that our guests could take home and reuse as coasters or home décor. You can find the whole tutorial here! We made these clear acetate boxes with the new Scoring Wheel and filled them with chocolate so our friends could enjoy some sweets later too! They worked perfectly for propping up our agate place cards. And get this! You don’t need glue to assemble them! I did reinforce them with some clear tape, but it is not required. Floral elements can end up costing a pretty penny. So we opted to use a mix of real greenery and florals with these gorgeous crepe paper flowers! I would have never guessed that you could make paper look so real! A great tablescape usually has lots of décor in a variety of heights. 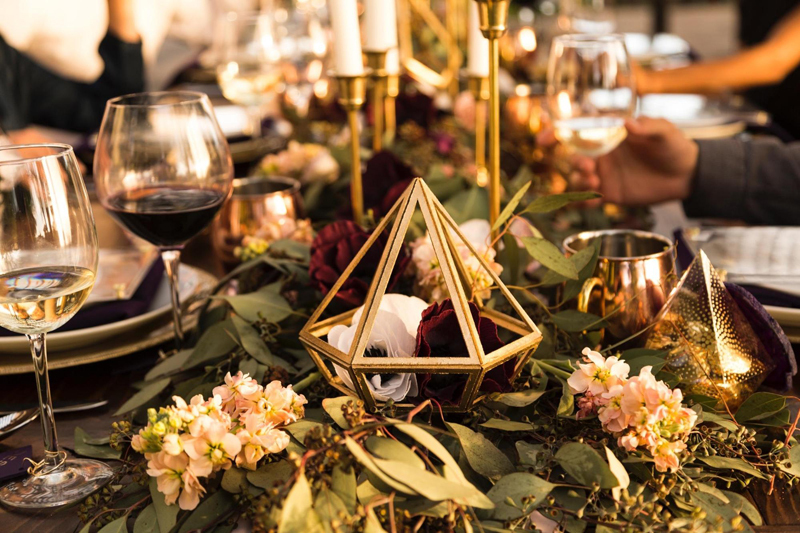 We used several brass candlesticks and mixed in these fun chipboard gems to add some statement pieces down the middle of the table. Check back for the full tutorial on how to make your own. Every fancy dinner party needs a menu! 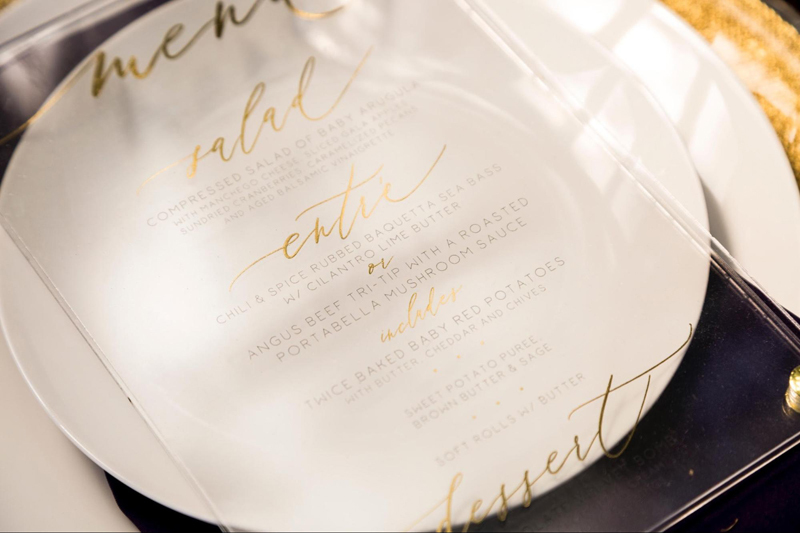 We went a little crazy with these acrylic menus and really tried to push our design outside of the box! 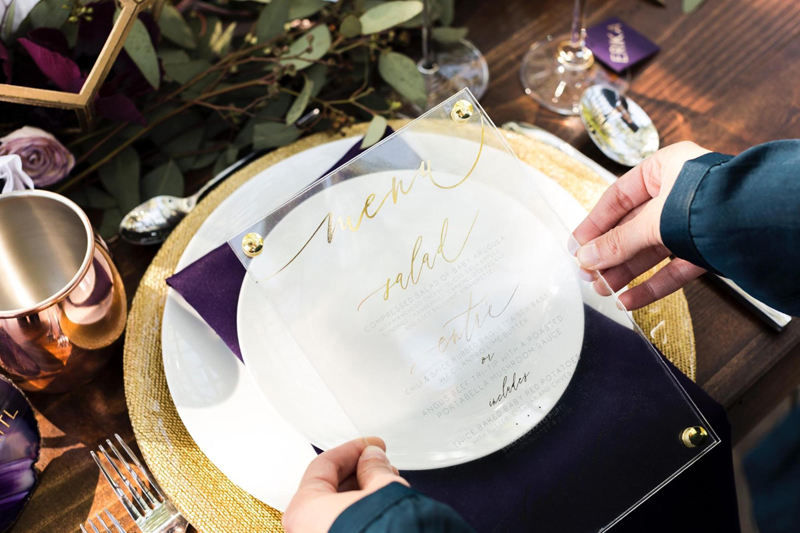 While these babies were stunning, we all agreed that if we were to recreate the event again, we would recommend simplifying the process to be a Print then Cut on paper. 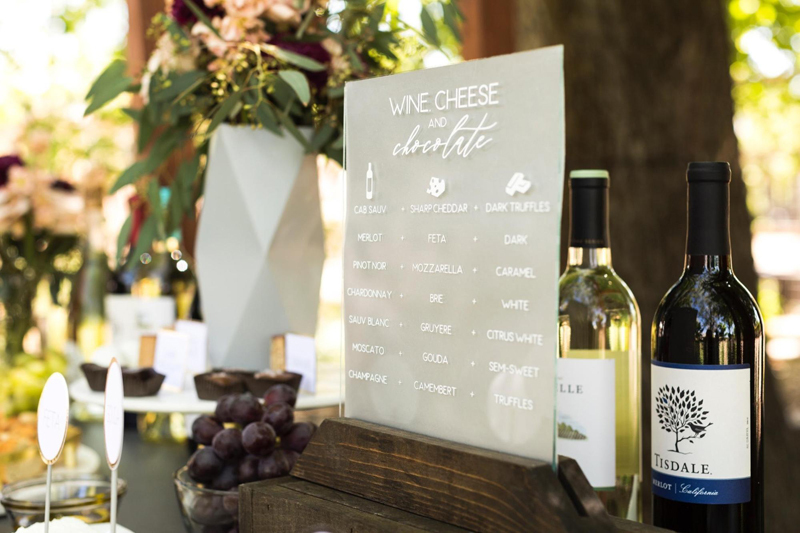 We used our new Cricut font, “Merlot” and “Plain Jane” to make these menus. Did you catch all five of those Cricut projects on the table when you first saw the photo?! 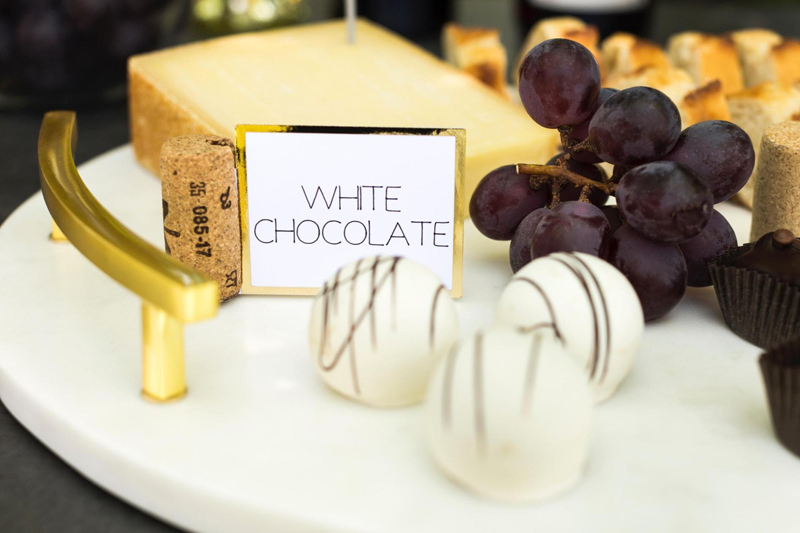 To take our dinner to the next level, we created a fun wine, cheese, and chocolate bar. Our vision began when we saw two large wine barrels. We decided to purchase a long table top and position it over the barrels to really take our party up a notch. 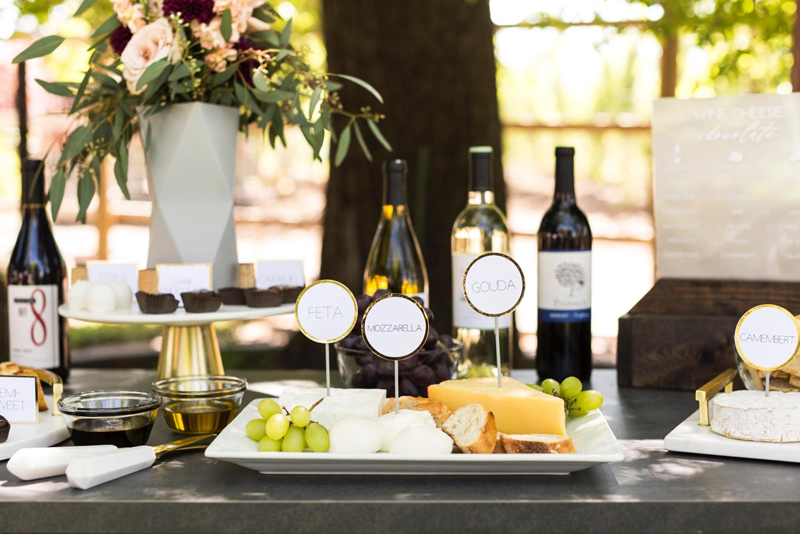 While we know décor is super important, we wanted to make sure we did our research and paired the right wines with all of the cheeses and chocolates. I created this pairing list that you can recreate here. I haven’t had a chance to taste them all, so you’ll have to let me know how they pair! We created some cute cheese and chocolate labels. The cheese labels were taped to lollipop sticks and we used old wine corks to hold our chocolate labels. Now I am totally craving some white chocolate! 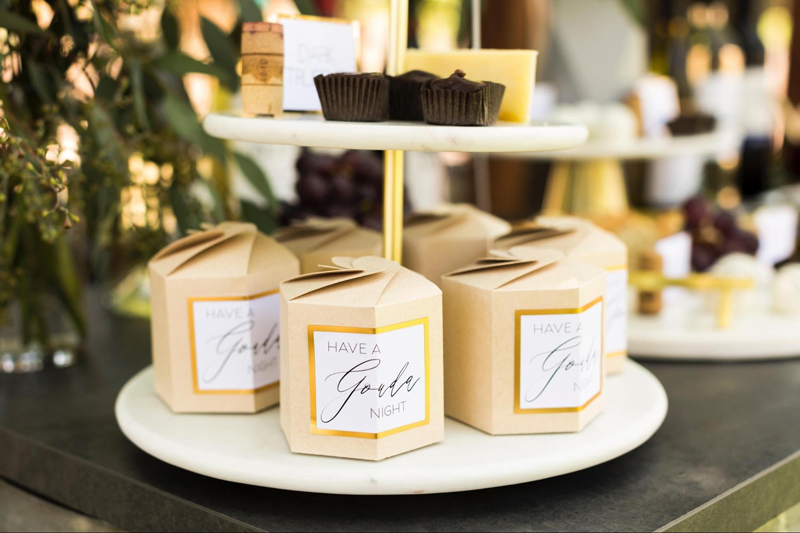 We planned on having leftover cheese and chocolate—so we provided little to go boxes for everyone to fill before they left. This pun was the hit of the night! 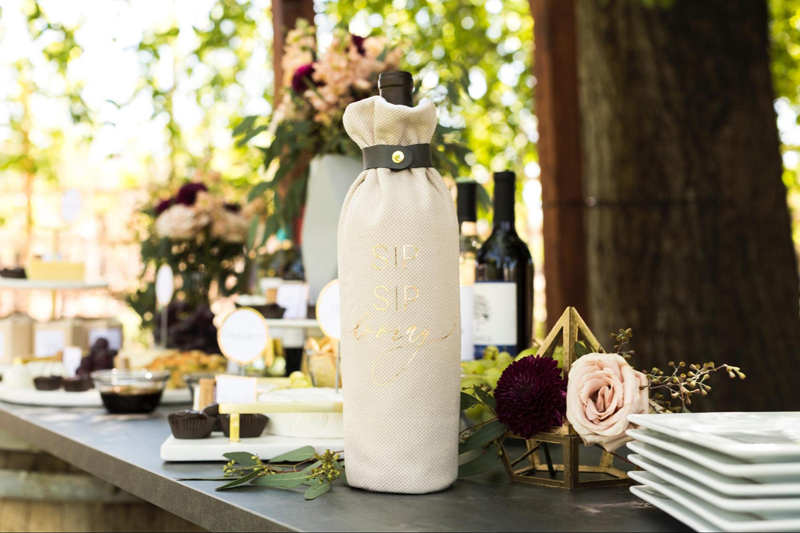 How adorable is this wine tote? Would you believe me if I told you that it was made 100% on the Maker? The fabric and leather were cut with the rotary blade and we added some iron-on to finish it up. One of my favorite pieces on the bar is this paper vase! Yep—it is paper! The Scoring Wheel set us up for success big time on this one. 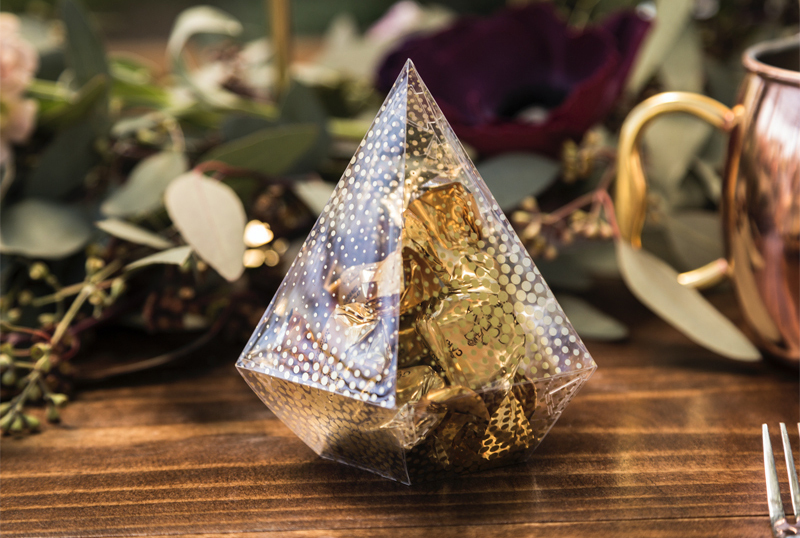 After the vase is assembled, you can place a container inside of the paper vase to hold water to keep your flowers fresh for your entire event. 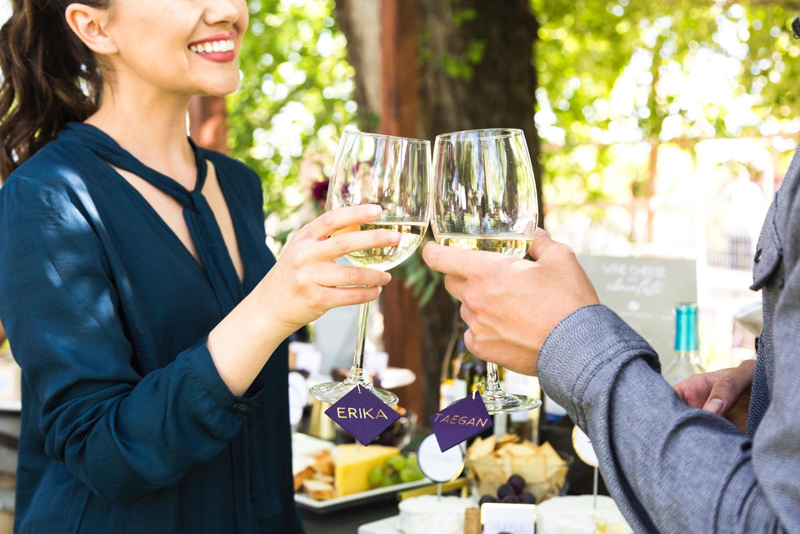 We added wine charms with our guests’ names so that we didn’t have any confusion over whose glass belonged to who! Everyone had a great time and went home with cute DIYs and lots of yummy leftovers. I think it was a total success. 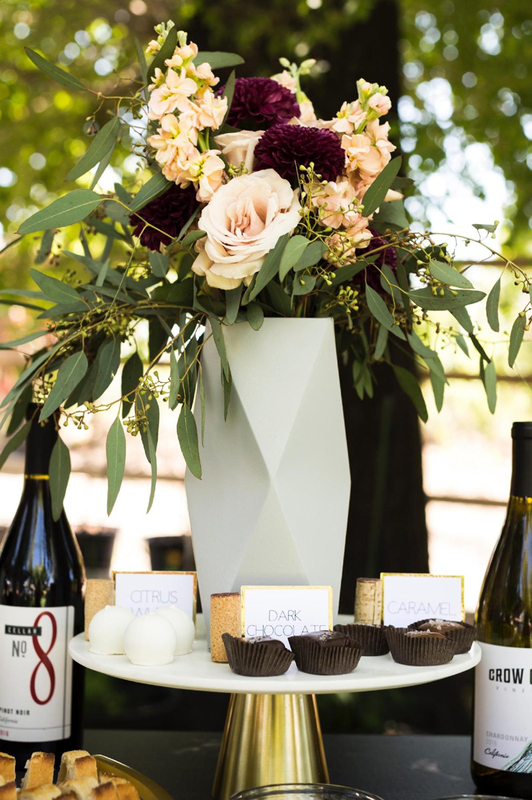 Do you see a wine, cheese, and chocolate night in your future? If so, head over to Design Space and check out all of these awesome projects. We also created a fun cartridge and font that complements this party perfectly. Make sure to test out the “Merlot” on your next project. So in love with all of this! Can I be invited next time? How about making the menus on vellum? Mountain Make-a-thon?! That’s our next big party ;)! This was a great way to set up the party. I am hosting my first ever wine tasting in a few weeks. This gives me some ideas. I have a small budget to work with , but I can make it elegant with your tips and the use of my cricut. Yay! Please share photos of your wine tasting with us! We love seeing what beautiful things you can make with the Cricut! love the acrylic menus. Where can I get the acrylic? It would be wonderful if i could do this for our wedding! I love this! Any advice on where to get the coasters? I would love to do this for our wedding coming up in place of seating cards!